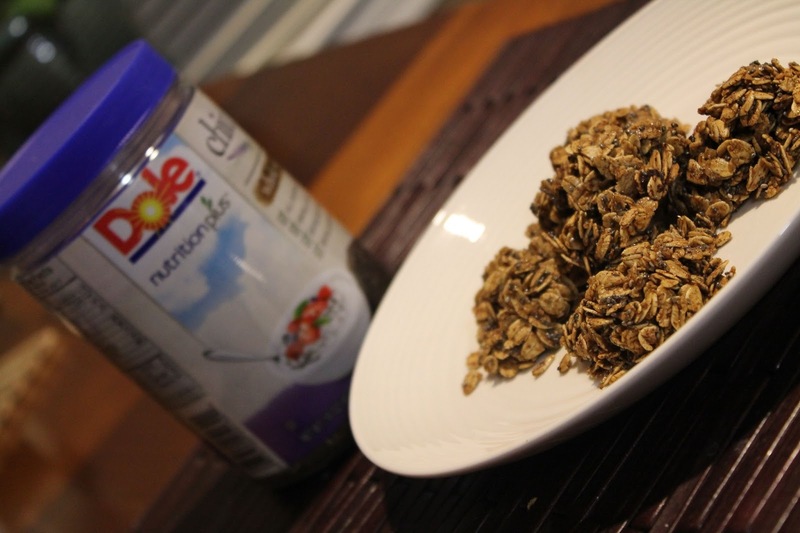 A few months ago, we incorporated the Super food Chia seed into our diet. I will be the first to admit that we do not eat enough fish and lack Omega-3 which is not good for runners. My friend Lauren introduced me to Chia and it's many wonders. She told me how she uses it in her morning smoothies, which has now become part of my daily routine. My friend Leslie also uses Chia on a daily basis, even putting it into her coffee or into dips for raw carrots. 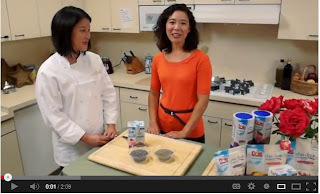 If you are unfamiliar with Chia or want a few tips on how to add Chia to your daily diet, check out this quick video from Dole Nutrition Plus. As mentioned in the video, the great thing about Chia is you can incorporate it into most recipes. Rich in omega-3 fatty acids, calcium, and iron, Chia is the dream seed for runners and athletes along with being great for weight loss. Chia seeds can hold up to twenty times their weight in water acting like a sponge and stabilizing blood sugar levels. I received a shipment of Dole Nutrition Plus Chia products to try out. I will be giving away a duplicate box to one of my readers (information at the bottom of this post)! I knew I wanted to make something other than a smoothie to showcase their product. 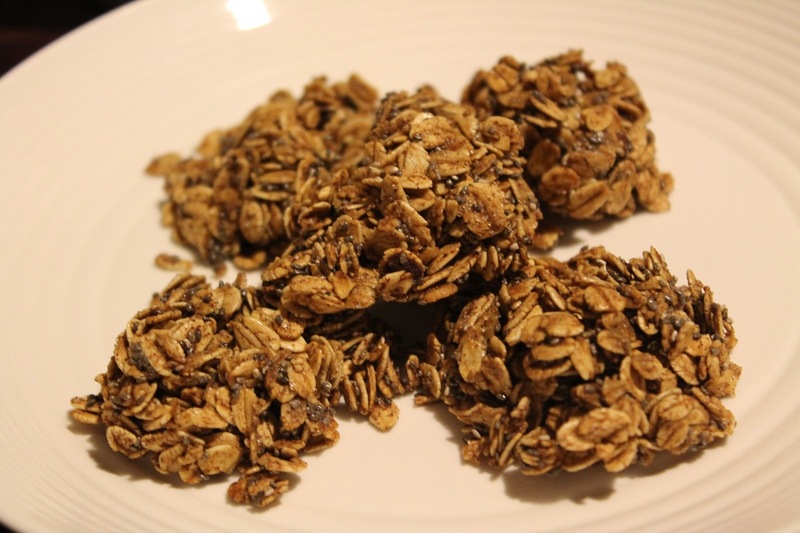 I had an aha moment and knew I was going to make Salted Caramel Chia Granola Clusters. They turned out perfect and I will be making these again! 1. Preheat an oven to 275 degrees F and line a 10x15 inch pan with wax paper. 2. Mix brown sugar and water in a microwave safe bowl. Microwave to dissolve the sugar, about 1 minute but watch so it doesn't over boil. 3. Combine oats, Chia, salt, nuts and cinnamon in a large bowl and stir to combine. 4. Add sugar mixture, honey, vanilla extract and stir. 5. Make clusters that are 2 tablespoons in size. 6, Bake in oven for 30 minutes. 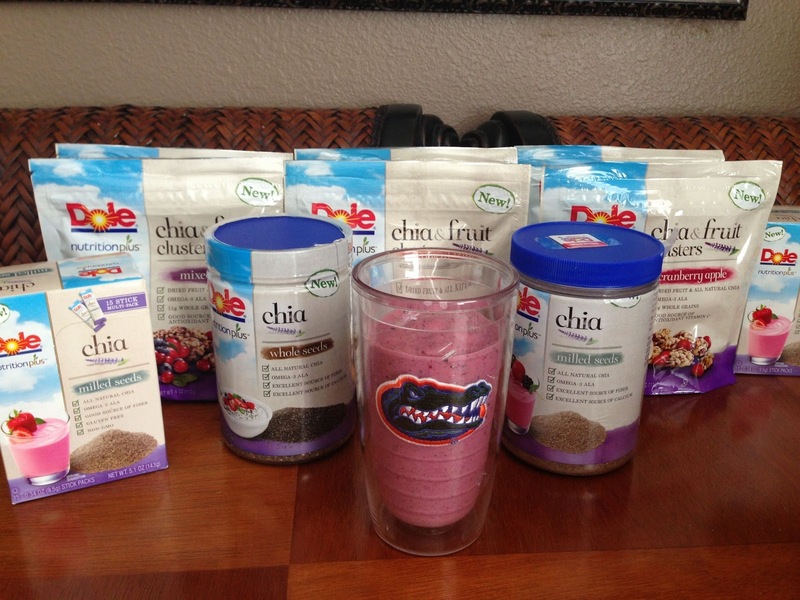 A Dole Nutrition Plus Chia Giveaway! Dole Nutrition Plus sent me a huge box of Chia. Along with Chia Whole Seeds and Chia Milled Seeds, I also received the new Chia & Fruit Clusters which are my new favorite snack. The single pouches of milled Chia is perfect for those on the go. Dole Nutrition Plus wants to give one of my readers $50 worth of Chia product. Leave me comment below with what recipe you would put Chia in. Make sure you enter through the Rafflecopter widget. If you’re unsure how to use Rafflecopter, here’s a quick video tutorial! Good luck everyone! a Rafflecopter giveaway From Runners World Magazine: A chia seed absorbs about 9-10 times its weight in water, almost instantly creating a gel-like consistency on the tongue. Chia seeds have a pleasant taste and crunch, making easy to add to salads, baked goods, yogurt, or tossed with rice. Chia seeds can be purchased in whole form, ground, flour, or already prepared in tasty options. Eat them raw, ground, roasted, gelled or baked. I would put them in my smoothies! I love chia seeds. I've only used them in smoothies, but there is a muffin recipe I desperately want to try! Definitely add a scoop into my protein smoothies! I love chia seeds! I always add it to my smoothies. I'd be like Leslie and sprinkle them on everything! i would love to add them to my rice! Oh, this is perfect! I have been wanting to try using chia seeds, great giveaway! Oops, forgot to say I would use them in an Agua Fresca first (lime w/ chia), which has been kn my to-make list forever! NICE post Megan!!! So much information but you made it all very easy to understand-even to those people who've never heard of the little wonders. Thanks for the shout-out too! They do add some nice texture to my daily snack of guac with celery/carrots. I will say it's a bit weird sipping them through a straw in my coffee but I've gotten used to it! Great post and recipe. I love chia! So filling and healthy. I love chia seeds, I use them in smoothies, bread, pudding and more! That recipe looks amazing! I want to make THAT!!! I love chia seeds on yogurt, smoothies and salads! Yum! Chia is great in puddings, yogurts and smoothies too!